Can you think of a suitable name for an Irish shark? If you’re under 14, and into art and sharks then the Irish Elasmobranch Group (IEG) needs your help. 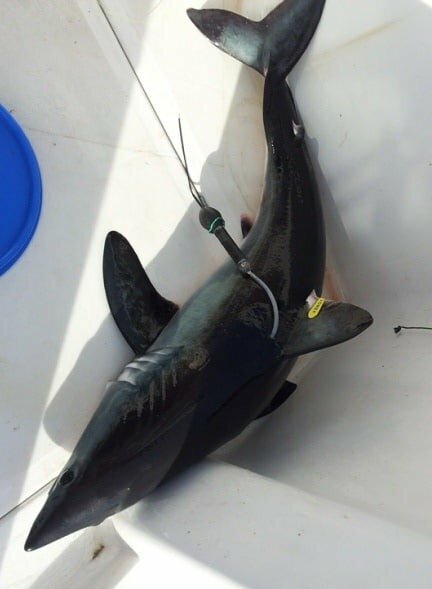 The group is looking for catchy and memorable names for five satellite tagged porbeagle sharks (Lamna nasus) currently cruising the north Atlantic after being tagged off the coast of Donegal recently. Three of the sharks were tagged with PAT tags – which log data and transmit it when they release in 9 months time. The other two were tagged with both a PAT tag and a SPOT tag, which lets the group track these two sharks in near real time (i.e. whenever the shark’s dorsal fin breaks the surface). You can track the movements of these last two sharks on the Irish Porbeagle Tracker page on the group’s website. So… just as the BTO named their satellite-tagged cuckoos… the IEG want’s you to help them name our Irish sharks. All our sharks are girls and they want nice pretty names so that we can tell them apart. All you have to do to win the chance to name one of our sharks is enter the art competition. Send a drawing of your favourite species of Irish shark, skate or ray along with a caption for your picture and your chosen shark name. Your drawing can be done with whatever materials you want e.g. pencil, paint, markers, crayons, collage etc. You’ll find full details of the shark-naming competition, along with an entry form and all the rules on the IEG website. The site also has lots of details about Irish sharks, and the research work the group is involved in.